Lactate Plus measures blood lactate (muscle performance indicator) very quickly on a tiny drop of blood. This results in a virtually painless, yet fast and accurate test for lactate. Lactate is the premier indicator of aerobic conditioning for athletes and a key predictor of competitive performance. Lactate tests on other meters are painful and therefore difficult to incorporate into routine training. They need from 5 to 25 microliters of blood, requiring a deep, wide-gauge lance to pierce the skin deeply enough to obtain a large sample. Lactate Plus requires only 0.7 microliters of blood. This allows use of the thinnest, most shallow, least painful lancing devices available, increasing the athlete’s tolerance for testing. The older technology used by other lactate meters requires 60 seconds for test results. Lactate Plus takes only 13 seconds. This speed means that lactate testing will be less intrusive on the athlete’s training. 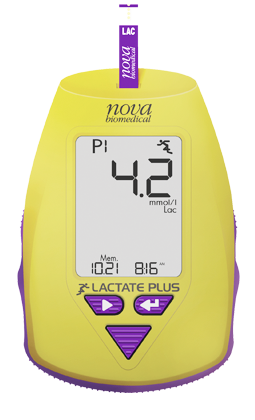 Lactate Plus is made by Nova Biomedical, the world leader in hospital-based, blood lactate analyzers. More hospitals worldwide use Nova for lactate measurements than any other brand. The same high standards for accuracy and reliability that are required for hospital use have been incorporated into the Lactate Plus meter. Lactate Plus meters and strips are priced less than most other similar devices. FDA Labeling:For in-vitro diagnostic use.